Part 39 of Wonders of World Engineering was published on Tuesday 23rd November 1937, price 7d. 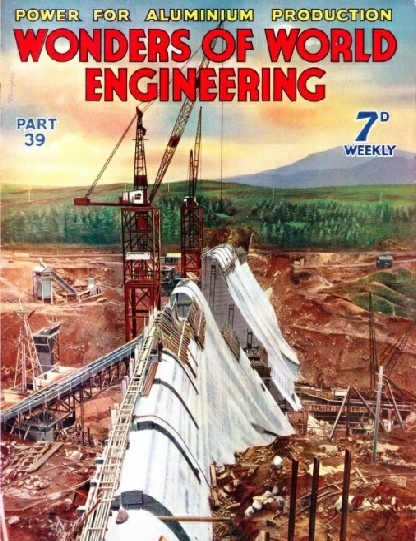 Part 39 includes a colour plate showing the building of Laggan Dam. It formed part of the article on Aluminium Production. The photograph which is reproduced this week as a cover and as a colour plate was supplied to me by C. S. Meik & Halcrow, the engineers responsible for the Lochaber Power Scheme, which is described in this week’s Part. 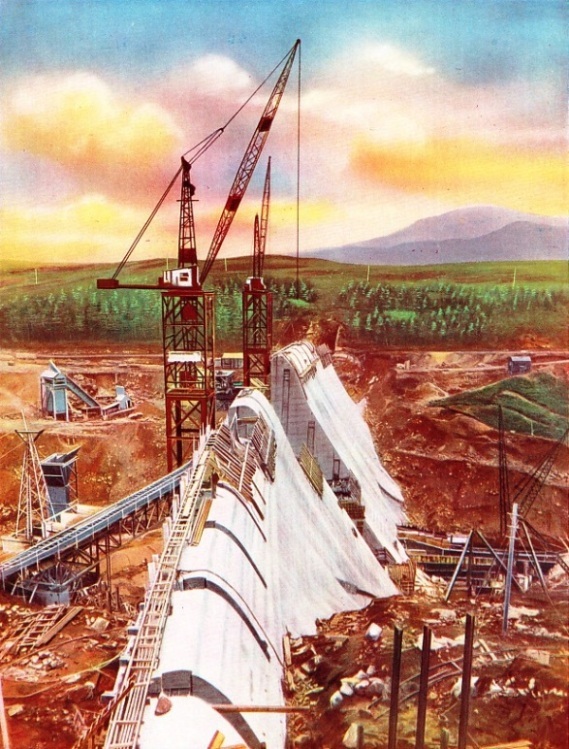 The photograph shows the later stages in the construction of the Laggan Dam, which was built across the River Spean in a gorge about five miles below Loch Laggan. The dam is a mass concrete structure 700 feet long at spillway level, and is 175 feet high. The first operation was to build a bridge for the contractors’ railway across the gorge just above the site of the dam. The central 200-feet span of this bridge was carried by two tall steel towers, on top of which were mounted the cranes for handling the concrete used in the dam. A tunnel fifteen miles long, under Ben Nevis, is but one of the major feats of engineering involved in the building of the huge hydro-electric undertaking to give power for the production of aluminium in the Scottish Highlands. 14 ft 8 in from invert to crown. 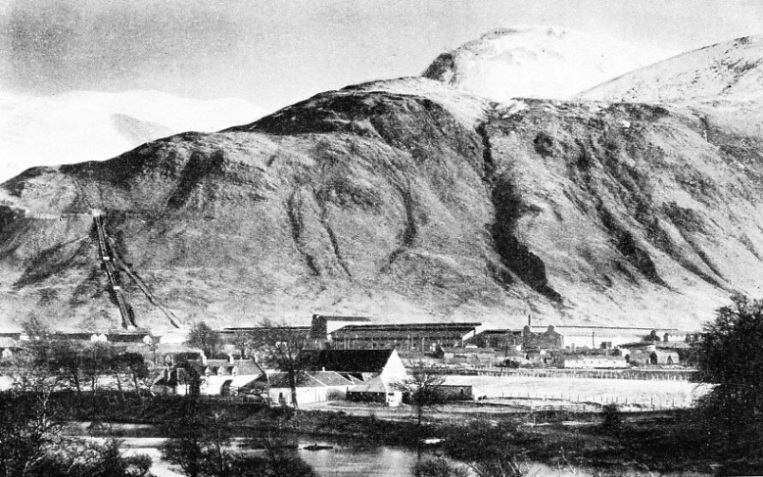 It is one of the major engineering triumphs of the Lochaber power undertaking, a scheme by which hydro-electric power is provided for the manufacture of aluminium at Fort William, Inverness-shire. For the economical production of aluminium from the ore hydro-electric power is essential and all the great aluminium works of the world are situated in districts naturally adapted to the supply of electricity by water power. The Highlands of Scotland are particularly favoured in this way. This chapter, by Peter Duff, describes the production and applications of aluminium, and will explain how engineers put into operation in the Highlands of Scotland one of the largest hydro-electric schemes of its kind. This article is the fifth article in the series Wonders of Water Power. UNDER THE FLANK OF BEN NEVIS, the highest mountain (4,406 feet) in Great Britain, are the power station and aluminium factory where the metal is extracted from alumina, or aluminium oxide, by an electrical process. Two and a half kilowatt years of direct current are required to produced one ton of aluminium. From raw material which consists of sugar canes perhaps 10 feet long, modern mills produce sugar of high quality, the chief waste product being used as fuel for the boilers which supply power for the manufacturing processes. 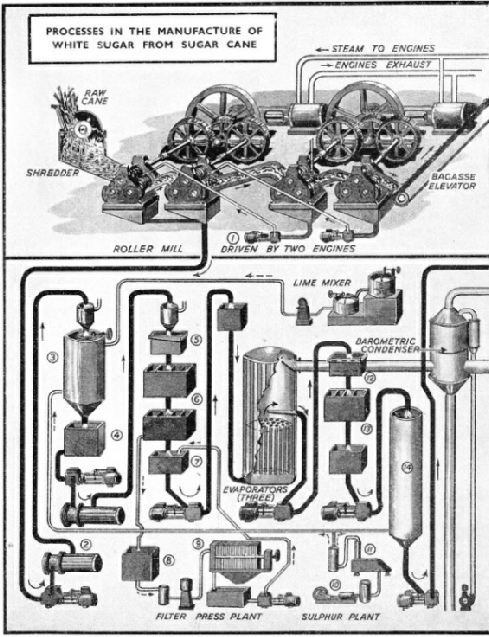 This chapter, which is accompanied by a special two-page flow chart, describes the manufacture of cane sugar from sugar cane. An interesting feature of the machinery of the factories which produce sugar from sugar cane is the preparatory treatment. On arrival at the factory the canes, which may be about 10 feet long, are passed along an endless chain conveyer to a machine which consists of numerous knives fixed on a shaft that is rotated at high speed. Here the canes are cut up in suitable lengths. They then pass into a drum which is turned at a speed of about 1,200 revolutions a minute. In this drum the canes are shredded ready for passing into the crusher. The waste material, known as bagass, is used as fuel for the boilers. 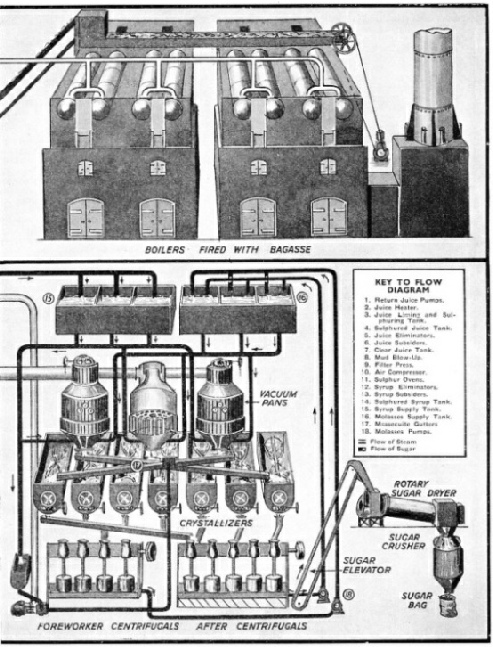 Steam is generally used to generate electricity for driving the plant. 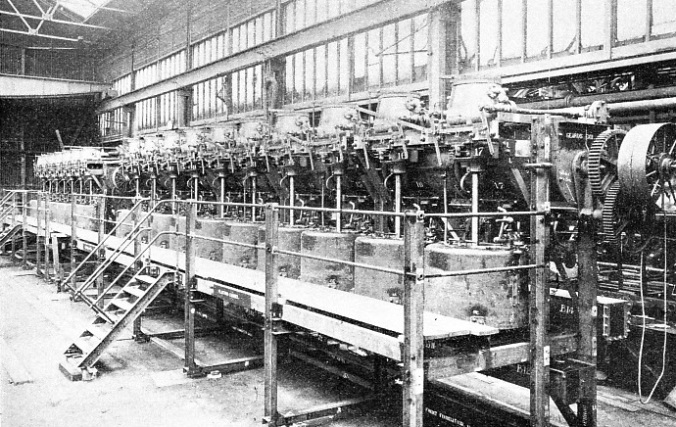 This chapter is by Edwin Judd and is the third article in the series Industrial Machinery at Work. The story of the bridging of the Firth of Tay after a disastrous failure in a battle against the forces of Nature. This chapter is by C Hamilton Ellis and is concluded from part 38. It is the thirteenth article in the series Linking the World’s Highways. TOWING ONE OF THE 245-FEET SPANS on pontoons from the assembling staging to its position between the piers in midstream. Hydraulic rams raised the ends of the span alternately as the piers were being built, until the span had reached the desired height. Transport has been completely revolutionized during the past fifty years by the invention and development of the petrol-driven car. The early work of a small group of pioneers laid the foundations of one of the largest industries in the world. Comparatively few people are familiar with the story of the inventions of Daimler, Benz and others, whose early experiments with mechanically propelled road vehicles prepared the way for the modern motor car, with its astonishing performance and efficiency. The annual run of “veteran cars” to Brighton from London always arouses interest, for the early motor cars are worthy of wonder and of admiration. Compared with our modern and luxurious high-speed cars, the “veterans” may be strange-looking objects, but they represent the efforts of motor engineers which led to a surprising revolution in transport and in everyday life. This chapter introduces a new series, entitled “The Story of the Motor Car”. This first chapter is contributed by C Hamilton Ellis, whose description of the “Early Steam Coaches” in Part 8 aroused considerable interest. 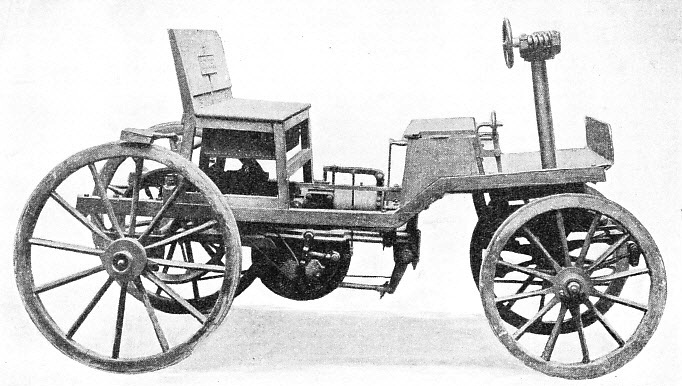 This chapter deals with the earliest motor vehicles and with the beginnings of motoring, describing particularly the pioneer inventions of Daimler and Benz. The author will take the story of motoring down to the ’nineties and succeeding chapters will bring the story to the present day. 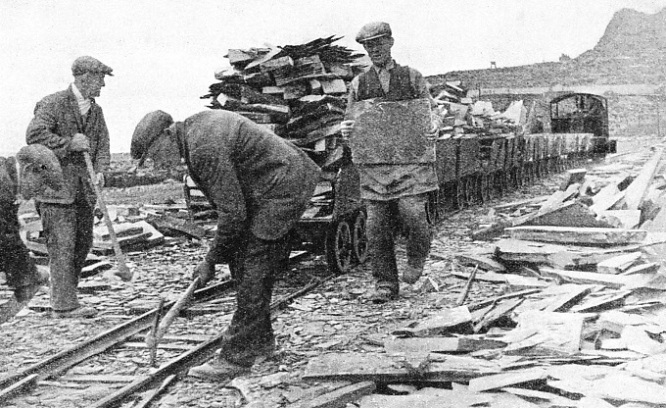 STEAM TRAMWAY TRANSPORT is used in the slate quarries near Blaenau Festiniog, Merionethshire. The benches of an open-cast quarry generally restrict the gauge of such tramways to less than 2 feet. ONE OF THE FIRST PETROL-DRIVEN CARS. It is said to have been built by Siegfried Markus, of Vienna, in the eighteen-seventies, but no precise details of its performance are available. Credit for the motor car, as we know it to-day, is generally given to Benz and Daimler, whose first vehicles, built in the ‘eighties, were the forerunners of the modern car. SET OF CENTRIFUGALS for a sugar mill. Centrifugals perform the final purification of massecuite, as the mixture of sugar crystals and mother liquor is called. Each centrifugal consists of a drum, with a diameter of about 40 in, revolving on a vertical shaft at a speed of between 800 and 1,200 revolutions a minute. BUILDING LAGGAN DAM, one of the dams designed in connexion with the Lochaber scheme for the provision of hydro-electric power for the production of aluminium at Fort William, Inverness-shire. The dam is a mass concrete structure 700 feet long at spillway level, and is 175 feet high. 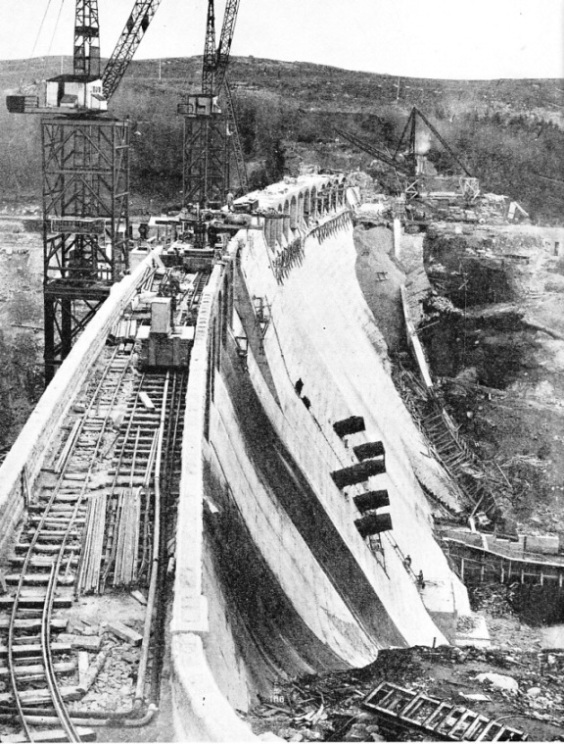 The first operation was to build a bridge for the contractors’ railway across the gorge just above the site of the dam. The central 200-feet span of this bridge was carried by two tall steel towers, on top of which were mounted the cranes that handled the concrete used in the dam. In the mountains of Wales are the largest workings of slate in Great Britain. Methods of quarrying and of transport vary considerably, according to the nature of the beds. The mountains of Scotland and, more particularly, the mountains of Wales contain large deposits of slate, a rock that has manifold uses. One of the largest slate quarries in the world was opened in the eighteenth century at Penrhyn, near Bangor, in North Wales. There are two methods of quarrying for slate, by cutting the side of the mountain in benches, or terraces, or by vertical excavation and mining proper. This chapter, by C Hamilton Ellis, describes how slate is obtained. Unusually for this series, the article is complete in this part. ACROSS THE RIVER SPEAN, a few miles below Loch Laggan, was built the Laggan Dam, a mass concrete structure, slightly curved in plan, with a length of 700 feet. The dam carries a road along a series of arches built above the crest. From the downstream face project the mouths of the six siphons which take away excess flood water. The flow of sugar is shown by the black lines.